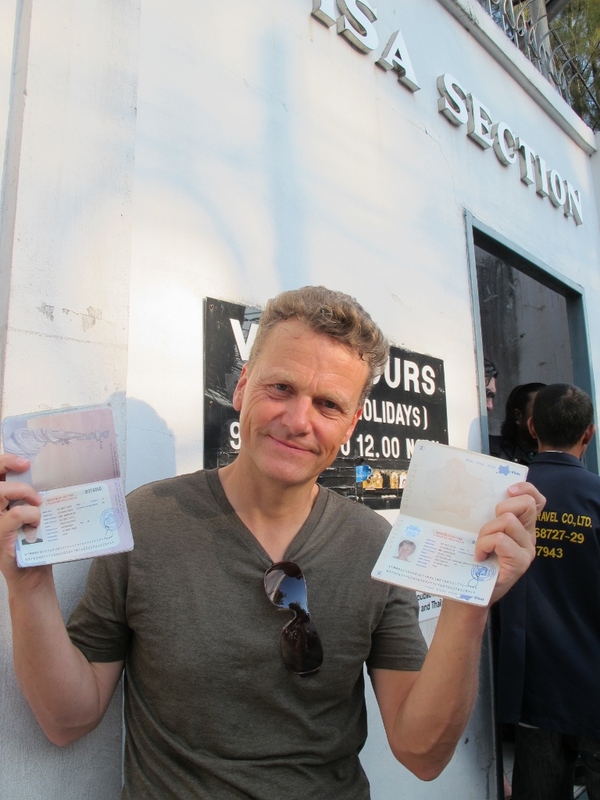 On our way to Myanmar we had to stop by Bangkok to acquire our Myanmar visa. Success! We have our visa. We arrived at midnight on Sunday and checked into our hotel at 1AM. At 7AM we showed up in front of the Myanmar visa office. The early bird gets the worm; we beat the other 100+ applicants and got second place in line. At 9AM sharp the office opened its doors and at 9.05AM we had filed our application and were back on the street looking for a tasty breakfast. Since we had done our Bangkok sightseeing a few years ago we just enjoyed the roof top garden of our hotel, the restaurants in the neighborhood and the Christmas decoration of the near by mall. Today, on the Thai Kings birthday, we are taking off to Yangon. I’m not sure how often we will be able to post in the next 3 weeks since internet and electricity are supposed to be unreliable in Myanmar. So, hang in and be patient! This entry was posted in Bangkok and tagged Around the World, Middle East by Georg Fick. Bookmark the permalink.